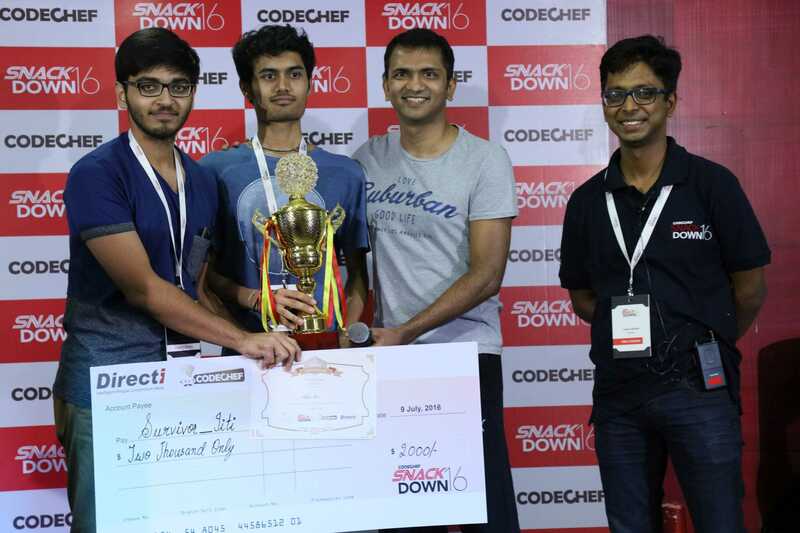 CodeChef, a non-profit educational initiative of Directi, a technology and web products company, successfully concluded the third edition of India’s largest onsite programming contest, SnackDown 2016. 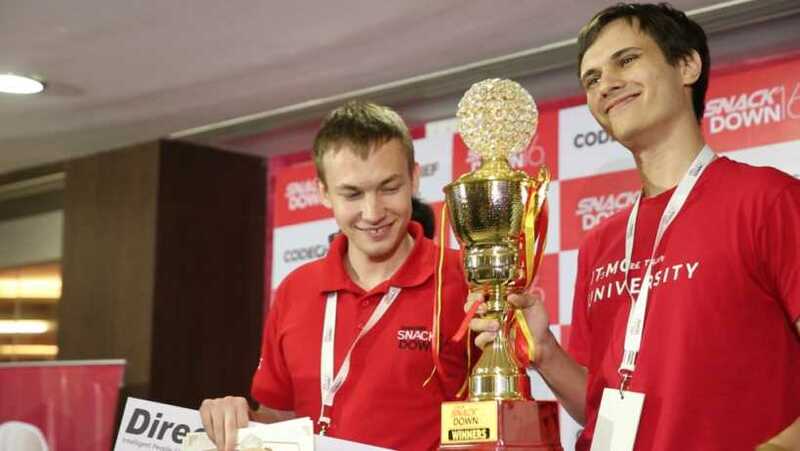 Borys Minaiev and Gennady Korotkevich of ITMO University, Saint Petersburg, Russia claimed the title of “SnackDown 2016 Champions” and a hefty cash award of $10,000. The finale held on 9th July witnessed top 50 teams from high schools, colleges, and corporate organizations from all across the globe, participate in a five-hour long onsite programming battle at CodeChef’s headquarters in Directiplex, Mumbai, India. SnackDown 2016 opened to rave responses with over 13 thousand teams comprising of 17,238 participants from more than 1185 colleges and universities, 215 schools, and 653 organizations from over 90 countries participating in different rounds of the contest. The event turned out to be the largest ever ensemble of computer programmers from across the world, in India, under one roof. The Delhi NCR region dominated in India in terms of number of participants, with Eastern and Southern regions coming in close second. Among the international participants, Russia, China, Japan, Belarus were the leaders in terms of performance. Among other winners, the second position was secured by lya Zban and Belonogov Ivan also from ITMO University, Saint Petersburg, Russia. The second runner-up slot was claimed by Ken Sugimori and Kohji Liu from University of Tokyo, Japan. The first and the second runner-up won $5000 and $3000 respectively. 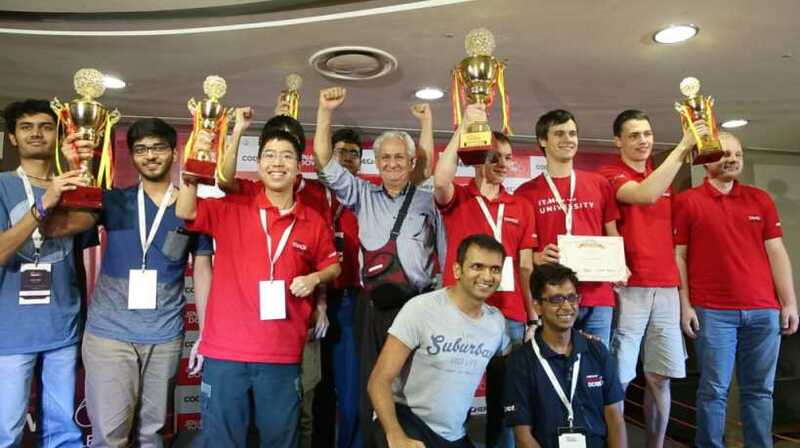 The best team from India was from IIT Indore featuring Aditya Shah and Utkarsh Saxena who won $2000. The other highlight of the finals was the one-member team of 16-year-old Arash Mahmoudian Bidgoli hailing from Atomic Energy High School, Iran. This high school student battling against the big guns from the programming world, solved seven out of the 12 problems and stood fifth. Arash also went on to emerge as the Best School Team, winning a cash award of $500. Among Indian schools, Rajat De and Sidhant Bansal of Delhi Public School, Dwarka led the table also being the third best Indian team in the competition. Right on the heels of SnackDown 2016, CodeChef also announced a three-day intensive programming camp at their Mumbai office in Directiplex – a first of its kind in India. It will be an extension of their goal to encourage them to excel at such competitions. Joining them, will be some eminent names from the programming world including Sergey Kulik, Kevin Charles Atienza and a few former ACM ICPC World Finalists from India. A panel of experts from programming fraternity has selected 22 students to be a part of this camp. The camp will touch upon advanced topics that will help these young programmers to move to the next level in the world of competitive programming. Initiatives like SnackDown are a firm step towards bridging the gap between programmers from India and the rest of the world. We wish to see the competition getting bigger and better with every edition. ← Is Panasonic Eluga Note worth buying? I have completed IT engineering from Mumbai University. My interest includes networking, electronics, gaming, programming, blogging, building things, watching movies, tv series. I have one goal to contribute in the education sector by spreading knowledge. I work to make a change in this society and encourage others to do the same. Is High Speed Internet Coming to Public Transportation?